The AMD FirePro M4000 is a middle-class mobile workstation graphics card with DirectX 11 support. It is based on the same Cape-Verde-chip found in the Radeon HD 7700M series. Compared to the Radeon consumer line, the FirePro offers certified drivers for professional 3D applications. Due to optimizations and some unlocked features, the performance when using professional applications is more efficient with the FirePro M4000. The integrated 512 Stream processors of the FirePro M4000 are based on the new GCN-architecture. The gaming performance should be slightly faster than the Radeon HD 7750M. Overall, the card is able to run modern games (2012) in medium details and HD resolution fluently. 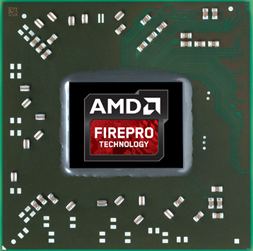 The FirePro M4000 also supports automatic graphics switching between the integrated GPU and discrete GPU. Called Enduro, the technology supersedes AMD's Dynamic Switchable Graphics and is similar to Nvidia's Optimus. Furthermore, the card can directly support up to 6 connected monitors using Eyefinity Technology if Enduro is disabled. Other features of the series include ZeroCore for reducing power consumption when the display is turned off and Power Gating to power down areas of the chip that are not used. PowerTune allows automatic overclocking and underclocking of the graphics card as long as the GPU is within its TDP range. For example, the chip may be underclocked when running FurMark and OCCT, but will overclock in certain games like Lost Planet, Crysis or Resident Evil 5. The power consumption of the M4000 should be best suited for notebooks 15 inches or greater.